The 25.07 metre motor yacht Milu II, listed for sale by Benjamin Bensahel at G-Yachts in Monaco, has had a €300,000 price reduction. 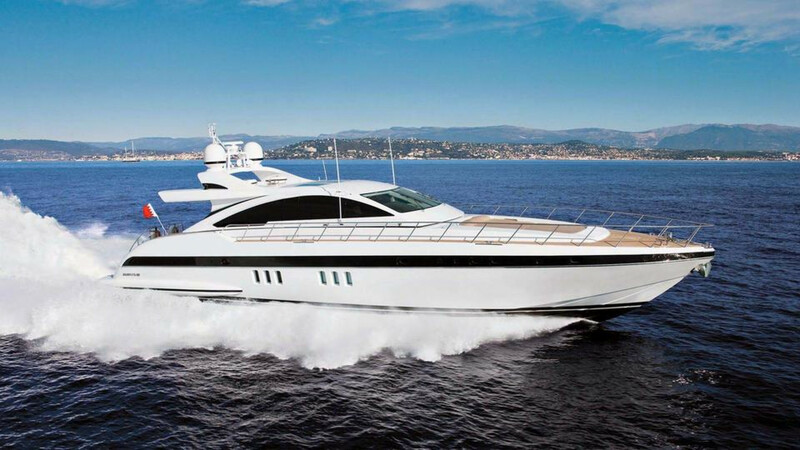 Designed by Stefano Righini, she was built in GRP by Italian yard Overmarine and delivered in 2009 as a Mangusta 80’ model with only one owner since new. The interior is decorated in wenge wood and natural oak, offering a pleasing blend of chocolate and cream colours in an interior accommodating seven guests in three cabins. These consist of a master suite, double and a twin with a Pullman berth, and all cabins have en suite bathroom facilities. A generous saloon has comfortable settees and armchairs, a bar and entertainment centre, while a dining area forward to starboard has seating for six guests and lockers storing glassware, china and silver. The large sheltered aft deck has built in upholstered seating on each side with free standing tables for al fresco cocktails and dining. Port and starboard stairways lead down to a broad swim platform offering easy access to the water for guests and toys. Uninhibited sunbathing is available on the foredeck. Twin 2,450hp MTU diesel engines have logged only 770 hours to date. Coupled with a fast planing hull and Arneson surface drive propellers, they give her a cruising speed of 35 knots. Lying in Naples, Italy, Milu II is now asking €1,900,000 with VAT paid.